Residents of the Flamingo Park neighborhood in Miami Beach know the area needs a new fire station. They just don’t like the potential location in a parking lot within Flamingo Park. Developer Russell Galbut is floating an idea that would keep the fire station out of a City park, combine City and County health services into a new building that includes the fire station, and provide more City park space. Miami Beach City Manager Jimmy Morales has another location in mind which he revealed in an email responding to Galbut’s proposal. It would utilize the current South Shore Community Center complex on 6th Street which is large enough to accommodate a fire station, parking, and Code Enforcement among other uses. Galbut’s is a multi-property proposal with the end result dependent on each piece of the puzzle falling into place. It starts with a property he owns at 824 Alton Road that has been on the market since 2017 according to LoopNet. 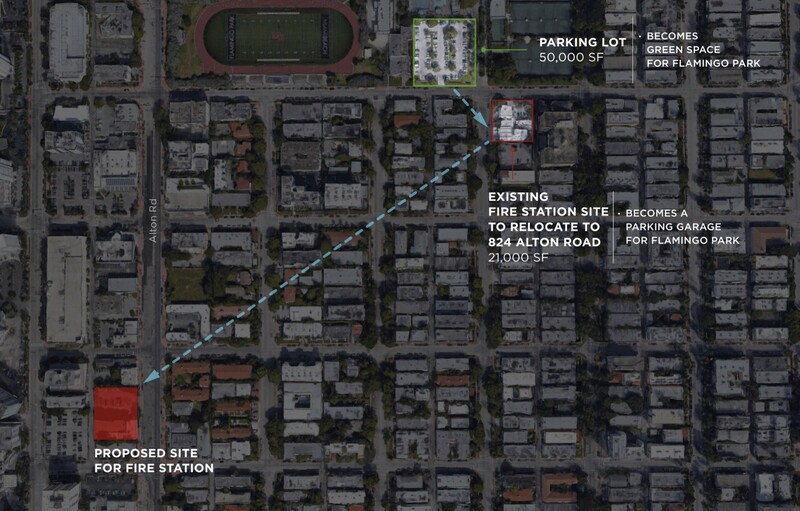 The existing fire station would move to 824 Alton. Its current site, 1045 Jefferson Avenue would become a parking garage for the Flamingo Park Neighborhood, and the 50,000 square foot parking lot now in Flamingo Park would be removed and turned into more green space for the park. The existing Prevention, Education and Treatment (P.E.T.) Center, a County operated facility owned by the City, would relocate from 615 Collins Ave to the 824 Alton Road site. The City could then sell the property to help pay for the development of the health and wellness center/fire station and, long-term, it would generate additional tax revenue for the City, Galbut said. 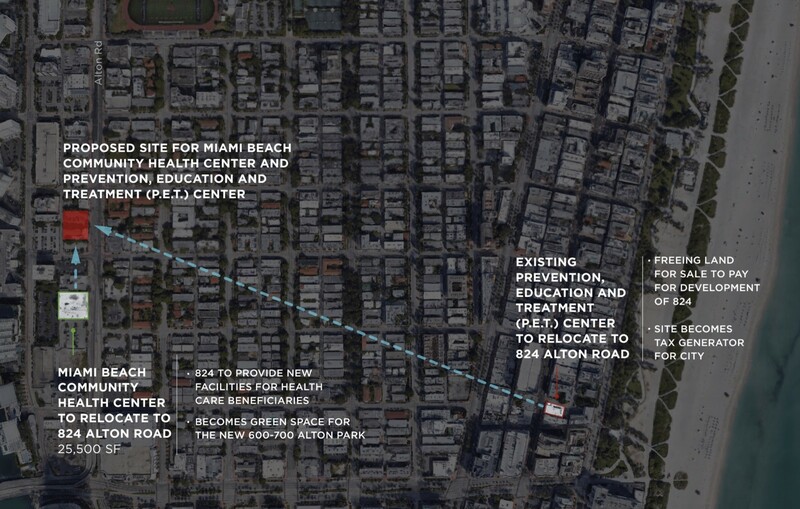 Finally, the Miami Beach Community Health Center, a facility which serves patients regardless of their ability to pay, would relocate from 710 Alton Road to 824 Alton Road. The property vacated by the Community Health Center would become green space that gets added to the new City park that Galbut is contributing to the City as part of the recently approved 500-700 Alton Road development. Galbut suggested the idea in an email to Mayor Dan Gelber and Miami Beach Commissioners. “We have been thinking about a win-win situation for our community to safeguard our community health services and expand our parks and recreation,” he wrote. Galbut told RE:MiamiBeach he estimated the P.E.T. property would sell for $15 million. The $10 million for Fire Station #1 is in the first tranche of the GO Bonds expected to be issued next month. Though the LoopNet listing indicates “price upon request,” according to a Real Deal article from June 2017, it was listed for $8.9 million. Covering 18,000 square feet, it is currently used as a parking lot. According to Miami-Dade County property appraiser records, Galbut purchased it for $5.4 million in 2015. 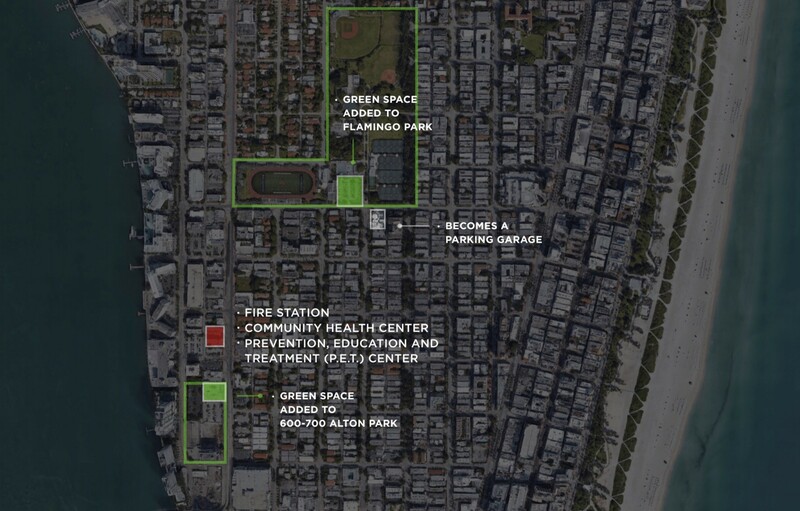 Total additional parkland for the City he calculates at 1.7 acres (50,000 square feet in Flamingo Park plus the 25,000 square feet from the Community Health Center). In his email, he touted the resiliency benefits of more parkland. City Manager Jimmy Morales responded to Galbut with a location that he and his team have been working on, two contiguous parcels now occupied by the South Shore Community Center complex at 833 6th Street. It involves fewer moving parts with no acquisition costs and does not involve some of the logistical concerns of the Alton Road property. “The good thing is that we may have more than one option that does not require us to build in Flamingo Park itself,” Morales wrote. I appreciate the proposal. We will certainly examine the idea, although the site is only 18,000 sq ft (smaller than our current fire station site), which is small to locate all that you mention there, which does not include our new PSCU unit and possible permanent new home for Code. There is also a potential problem with the entry of fire trucks (may have to back up on to the site). Not ideal. I have actually identified a site that would work better for Fire and could accommodate multiple uses. The current South Shore Community Center complex sits on two contiguous parcels on 6th Street that total 84,000 sq. ft. There is plenty of room for a new fire station, parking, PSCU, Code and replacing the existing space for the non-profits that are there. We can keep the old fire station running until we open the new one, and the new location provides much better access for entry and exit for the fire trucks. It is land we already own, so there is no acquisition cost. Staff is doing a full analysis of this site and we will be bringing this proposal to the GOB Oversight Board and the City Commission. 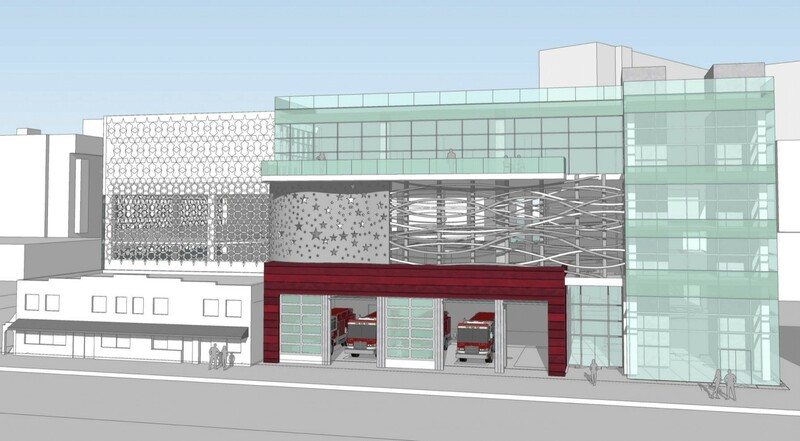 The site of the current fire station at 1045 Jefferson could be examined for a parking garage as you indicate, or any other use that the City Commission deems is in the best interest of the City. This approach also has far fewer moving pieces to it and does not require us to sell any other land.